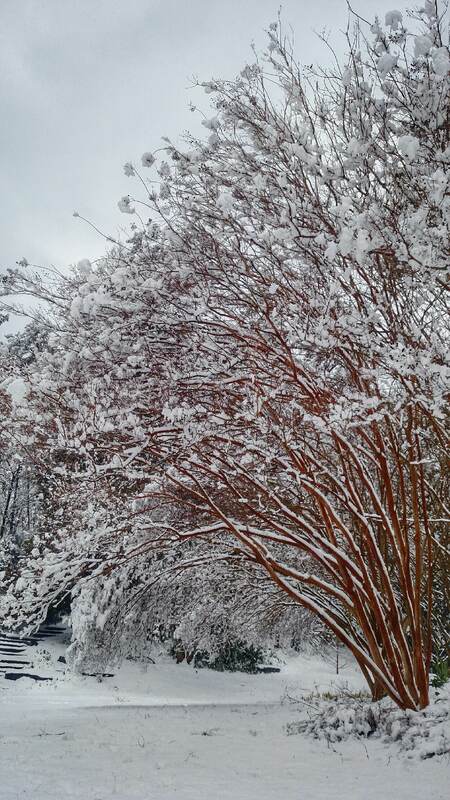 When I think of North Carolina, I don’t usually think of snowstorms, but that’s just what we got this week when a massive system blew through and left up to eight inches of snow in its wake. I am a native Maine-er, and I was thrilled to see my North Carolina home look a lot more like New England – at least for a few days. 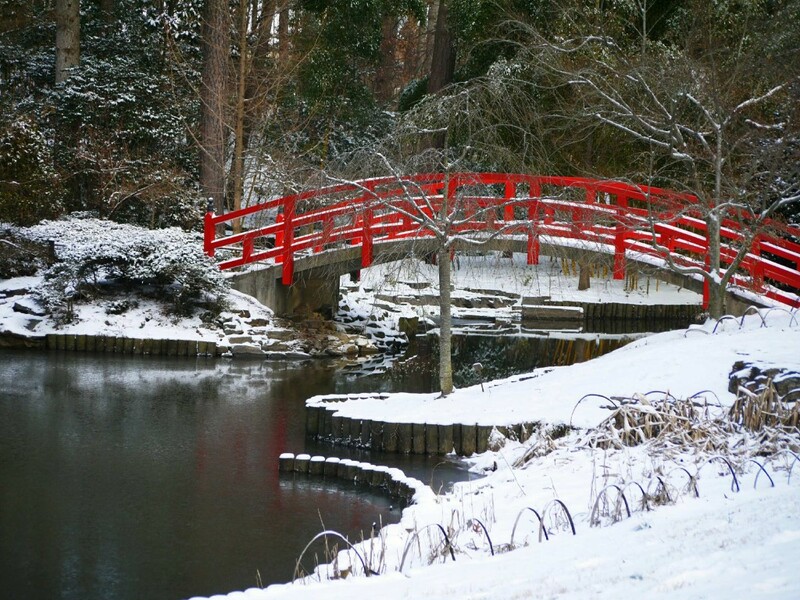 There’s no better place to enjoy winter scenery than Duke Gardens. I wasn’t alone as I explored the new snowy wonderland; there were dozens and dozens of students out and about as well, taking pictures, building snowmen, and just enjoying the day off. My fiancé and I made a bee-line to the Japanese-arched bridge by the Garden Pond. It’s bright red paint particularly popped in the winter scene, and I think it has never looked better. The ducks were swimming in the small patches of open water, fed by a dedicated Duke Gardens staff member who had come in with their breakfast. 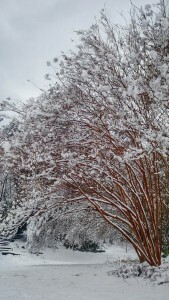 Wherever we walked beneath trees we received a dusting of wet snow, as the tree limbs shook off their heavy burden. 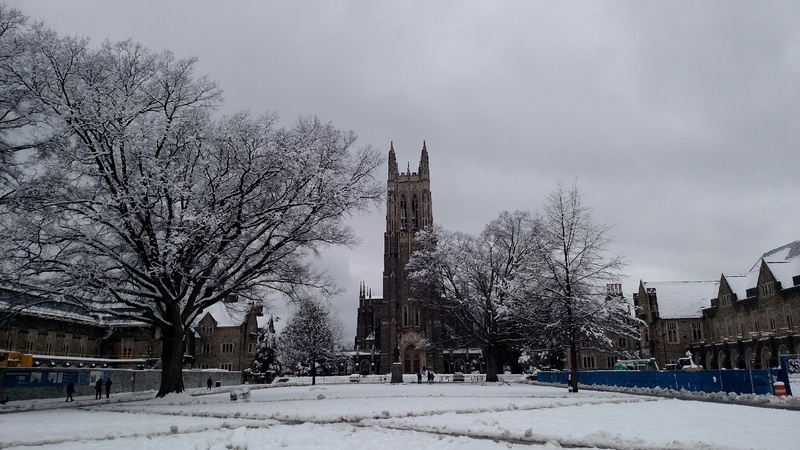 On the Duke Gardens’ field students were sledding on cardboard encased in garbage bags, slip sliding down the gentle incline on their make-shift sleds. One creative student had even lugged his surfboard up the hill, riding an icy wave down to the bottom. 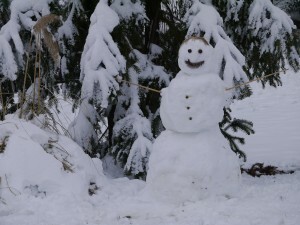 Another couple was in the process of building a giant snowman, whose base already reached my shoulders. No visit to campus would be complete without a view of the Chapel in these unique weather conditions, so we spun up to the main campus, where even more students were building snowmen (the activity of choice it seems). 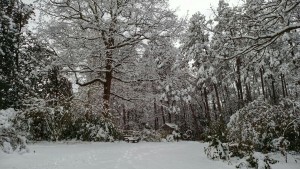 The whole scene was beautiful, a mix of blues and grays set off by the shining snow. On our way back through the Gardens, we stopped at a feeder station, visited by at least fifty birds sheltering in nearby bushes and trees. There were Cardinals, Pine Warblers, Song and White-throated Sparrows, Eastern Towhees, Carolina Chickadees, Tufted Titmice, and even a Brown Thrasher, all feeding from one of the few food sources that wasn’t completely covered by snow. Returning home, I spent the rest of the afternoon devoted to schoolwork. Still, there is nothing like a snow day to remind us students of school-day memories of the past, as well as inspire us to make new ones! Note: During any explorations after a storm, please remember to stay safe, do not go into restricted areas, and watch for falling tree limbs.